The area was first settled by Europeans under a land grant, not from the King of Great Britain, but from the St. Francis Indian chief, called King Philip by his white neighbors, after the great King Philip who had led many successful raids on New England settlements during the 1670s. This grant was sold to one land-speculation company, while a second group of Indians from the same tribe made representations to another company of Europeans that their chief had been deposed and that they were empowered to issue a grant to the second company. Following the Revolutionary War, both companies surveyed the territories and issued their own land grants to settlers, which frequently overlapped one another. After the War of 1812, when both companies were in financial straits, they merged and reconciled all land claims. The establishment of Indian Stream as an independent nation was, essentially, the result of the ambiguous boundary between the United States and Canada as defined in the Treaty of Paris. There were three possible interpretations of where "the northwesternmost head of the Connecticut River" might be. 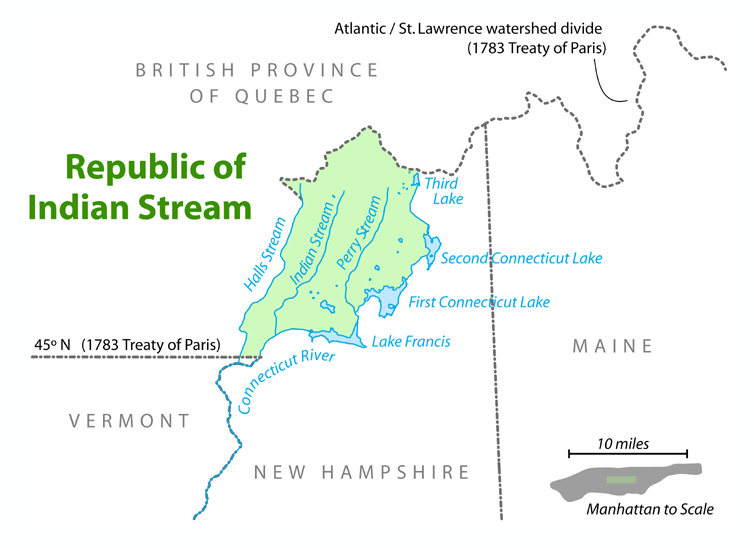 As a result, the area (in and around the three tributaries that fed into the head of the Connecticut River) was not definitively under the jurisdiction of either the United States or Canada.
" ... (westward) along the said highlands which divide those rivers that empty themselves into the river St. Lawrence, from those which fall into the Atlantic Ocean, to the northwesternmost head of the Connecticut River; thence down along the middle of that river to the forty-fifth degree of north latitude; from thence by a line due west on said latitude ... "
The Republic encompassed the northern reaches of what is now the state of New Hampshire, including the four Connecticut Lakes. While the British claimed the southeasternmost branch (the chain of Connecticut Lakes), the U.S. claimed the border as we know it today (i.e., Hall's Stream, to the west, which is, arguably, the "northwesternmost headwater" of the Connecticut). Both sides sent in tax-collectors and debt-collecting sheriffs. The double taxation angered the population, and the Republic was formed to put an end to the issue until such time as the United States and Great Britain could reach a settlement on the boundary line. The Republic ceased to operate independently in 1835 when the New Hampshire Militia occupied the area, following a vote by the Indian Stream Congress authorizing annexation to the United States. The vote arose from disquiet regarding a prior incident in which a group of "streamers" invaded Canada to free a fellow citizen who had been arrested by a British sheriff and magistrate. The reason for the arrest was an unpaid hardware-store debt, and the offender faced confinement in a Canadian debtors' prison. The invading posse shot up the judge's home where their comrade was being held, and this caused a diplomatic crisis, a so-called 'international incident'. The British ambassador to the United States was appalled at the idea of a war over a matter so trivial as a hardware-store debt and quickly agreed to engage in negotiations to resolve the border disputes that had remained outstanding since the time of the Treaty of Paris (1783). Britain relinquished its claim in January 1836, and American jurisdiction was acknowledged in May 1836. The area was still described as Indian Stream at the time of the 1840 United States Census taken on June 1, 1840; the local population totalled 315. The area was incorporated as the town of Pittsburg in 1840. The town covers 291.4 square miles (755 km2), of which 282.3 sq mi (731 km2) is land area and 9 sq mi (23 km2) is inland water. In 1842, the land dispute was definitively resolved by the Webster-Ashburton Treaty, and the land was assigned to New Hampshire. However, the 1845 Lewis Robinson Map of New Hampshire based on the latest authorities, shows the boundary north of the town of Clarksville but just south of modern-day Pittsburg.